This year it is not in our budget to go buy a bunch of halloween decorations. I still wanted to make the house look festive for my son so I decided to make my own decorations for cheap. Making your own decorations is a great way to get the family involved in "craft time" and you will be suprised at how many things you can reuse in your home all while saving money and recycling! paper plates, water bottles, milk jug, shoe boxes (or any cardboard boxes) string, scissors, tape, black marker, orange white and black paint, medium paint brush. 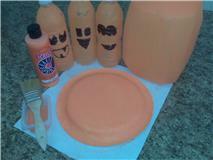 To make pumpkins: Paint the milk jug, some water bottles, and the back of the paper plates orange. Then use the marker to draw a jack-o-lantern face. You can fill the jug and bottles with sand, rocks, or whatever else you have around to anchor them and set them out on your porch. 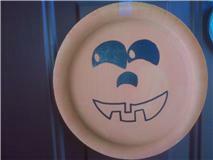 You can use the string or tape to hang the paper plate pumpkin face on your door or windows. To make flying ghosts or bats: Paint some of the water bottles white and the others black. Draw whatever facial features you'd like onto the white bottles to make them look more like ghosts. Then use the string to hang the bottles from your trees, light fixutes, or somewhere inside the house. Window decals or yard decorations: The shoe boxes and paper plates can be used to make your own window decals. Just paint, draw, and cut out whatever shapes you like. The shoe boxes or cardboard boxes can make great tombstones. So far I have hung a paper plate mask on our front door, and put pumpkin water bottles in each window (they have gotten some rave reviews around the neighborhood) and I have hung up some flying ghosts. Be creative, have fun, and enjoy yourself. See what fun decorations you can come up with! Here are a couple of ours. You can also use leaves or grass to glue to your plates or bottles to give them a more authentic look. Or collect your leaves and put them in a white garbage bag and draw/paint a face on it for a festive lawn decoration. The ideas are endless... will you try making some of your own decorations this year? Very creative! These decorations look great. I'm following you from MBC. Also check out Martha Stewart's free templates for silhouettes- you can do a lot with just some black paper! Great work and very creative and interesting. Thank you all very much, I'm glad you have enjoyed my simple yet easy decorations. I will be checking out the Martha Stewart's free templates... and using up our constuction paper good tip!